The actual telephone in the studio/location? A person from the crew creating a ringing sound? For example, I was watching an episode of Inspector Morse recently and Morse and Lewis where talking in their office. They were interrupted by a telephone ringing. What would have happened in that situation? It depends on the director and the crew's capability, as well as the actor's ability to act with or without an audible cue. You can have a regular phone hooked up to a regular phone line or PBX and then ring it by calling it or it's extension. Actors can listen and speak to person on other side - perhaps boths sides can be recorded, but also it encourages natural pacing even if only one side ends up on film. You can have the actors act as though it rung, answer it, and add it in post production. You can buy phones that ring on cue. 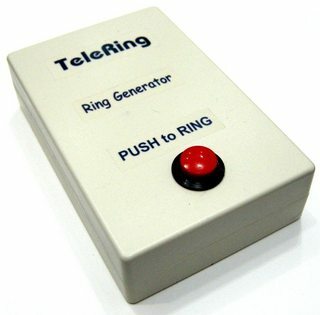 You can buy devices that ring phones for you by applying the correct signals on the phone line. Can use any standard phone, even decades old since the standard has been around for so long. This gives the director more options, and they can rent a phone from a prop company and don't have to modify it. Some allow two phones and recording both sides. For cell phones you can do nearly all the above as well. You can use an active, real cell phone in the scene and call it. Must be managed more carefully - battery dying at the wrong time could scratch a take, and could take time to charge and reset the scene. You can use a real cell phone but only pretend to answer it and add sound in the post. If there's a display the actor may need to use the phone in a way and at an angle that prevents the display from showing on camera which can be done well, or poorly. You can use a fake cell phone with a screen dummy that allows both sound and CGI to be added in post so the display operates as the director wants it to. Requires more post production, but with a green screen and markers on the display face this isn't the chore that it used to be. A lot of this comes down to the effect the director wants, the capability of the actors, and the capability of the effects crews that would be involved. There are always other methods, this is just a simple overview. It could be any of the three methods, but the simplest method is to actually ring the phone, live on set, at the appropriate moment. A telephone ringer is a device that any props department would have in their armoury. It just generates the correct voltage for the ringer circuit in the phone & is simply push-button activated. If the actor answers the phone in the scene, no-one needs even worry about what line to release the button, the phone will naturally stop ringing, perfectly in sync. This saves a whole slew of technical issues later, trying to match the sound & acoustics in post. Not the answer you're looking for? Browse other questions tagged sound-effects .